Here are some ways to help your child develop their fine motor skills, spatial awareness, and to stimulate their senses. 1) On a warm day, take your child outside and give him a bucket of water and a paintbrush. See what kinds of pictures and creatures your child can paint. 2) Read together and enjoy books with different illustrations. Try to create your own art using the techniques from the book. 3) Provide a place for your child to work. Furnish it with supplies - tape, crayons, markers, glue sticks, child safe scissors, etc. You may need to use a small bookshelf or plastic totes to help keep their supplies. 4) Finger paint with food. You can use chocolate pudding, applesauce, Gogurt, icing, whipped cream, etc. Give your child a cookie sheet to work on or cover the table with a clean vinyl tablecloth. It's ok to taste your creations! 5) Have a box of junk to use. Put those film canisters, toilet paper rolls, paper towel rolls, small boxes, scrap paper, and cardboard packaging into a box for your kids. Let them glue them, connect them, build with them, etc. 6) Make edible art. Use pretzel rods, gumdrop candy, marshmallows, fruit roll-ups, plastic straws, coffee stirers, crackers, etc. Make shapes or buildings. Just have fun! 7) Play with edible playdough. Here are a few recipes to get you started. 8) Glue a random object to a piece of paper and let your child create something. The object used could be a leaf, shape, sticker, etc. 9) Make creatures out of fingerprints or handprints. Give your child some washable ink and let them make fingerprints on paper (younger children will need help). Encourage them to make butterflies, bugs, dinosaurs, and other creations from the prints. 10) Save your spray bottles and fill them with diluted paint. Let children use them to spray poster board, cardboard, etc to make their unique picture. 11) Keep a supply of old magazines in the art station. Encourage children to cut out pictures to make a collage about families, food, animals, cars, etc. 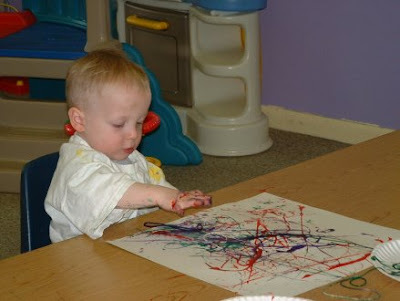 12) Allow children to paint with different objects. Some suggestions are cookie cutters, string, toy cars and trucks, golf balls, marbles, straws, fingers, different sized brushes. When I was teaching, we would use old newspaper and vinyl tablecloths to protect the tables. Old shower curtains also work well to protect the floor. When the children were finished with their artwork, I would put it on an old shower curtain to dry. If the paper was big, I would hand it on an indoor clothes drying rack (with shower curtain underneath to catch drips). What fun artsy activities do you enjoy with your children? Ooo, what a great site! I could definitely use some ideas for my busy toddler! And thanks for stopping by my blog!